I know, I know….I need more fabric like a stinkin' hole in the head. What can I say. But I just could not resist these beautiful new fabrics, Summer Soiree from Paula Prass. Looks great with that roll of vintage wallpaper. That wallpaper is part of a big "before/after" project that I am tackling tomorrow. Can't wait to dive in, get it done and brag about the results. oh yeah. I have a similar pile myself. But boo hoo, no cool vintage wallpaper. Marvelous patterned fabric.. oh, and the creole on the post down below looks pretty fabulous too! 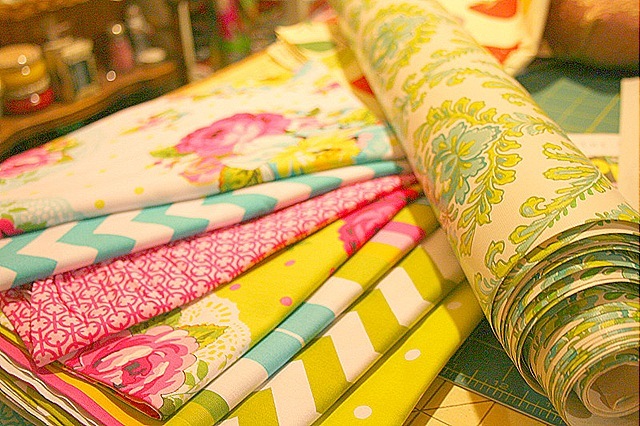 What great fabrics – fun colors. Love that wallpaper, can’t wait to see what you do with it.